Grez en Transition - Rob Hopkins vient visiter Grez en Transition ! Accueil > Le projet > Les événements > Rob Hopkins vient visiter Grez en Transition ! Rob Hopkins vient visiter Grez en Transition ! Retransmission en direct de la conférence de Rob Hopkins du lundi 26/1 au soir via "RTBF en ligne". A Nethen, le 27 janvier au matin, Rob Hopkins  rend visite à Grez en Transition. Et en particulier, dans le cadre de la promotion de son nouveau livre au Seuil "Ils changent le monde ! ", il vient discuter de GeT’iT, l’atelier d’économie locale, sociale et solidaire. The group has lots of projects underway, and exciting new ones planned. They have an Incredible Edible project, they do skillshares, workshops on preserving food and wild food walks, a project to do with growing grains locally, and the place I visited first, Potager Graines de vie ( “Seeds of life”). 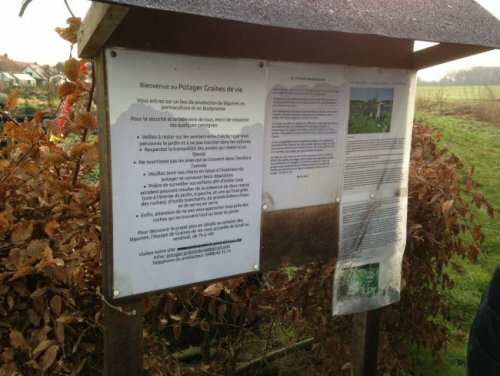 Welcome notice board at Potager Graines de vie (photo RH). It’s a community supported agriculture scheme run along permaculture and biodynamic lines. It supplies food for 100 local families for 8 months of the year. Although clearly late January is possibly the least insightful time to visit a food garden, it was still fascinating to see. The garden is laid out in concentric rings of raised beds, interspersed regularly with beds featuring perennial plantings which attract beneficial insects and increase the overall biodiversity. The garden also has many beehives at the far end, and although the garden is largely surrounded by monoculture farms, honey yield has risen consistently since the garden started, a fact the head gardener, Herman Pirmez, put down to the biodiversity beds. We toured the garden and then headed back to the house of the farmer on whose land the garden sits. He is in the process of turning his 60 hectare farm into an agroforestry farm, with alley cropping and mixed tree varieties. His observation was that being a farmer can be a very lonely life. Since the creation of the garden and working with Grez en Transition, he now feels as though he is actually farming relationships, community and connection. Sadly that’s the one key thing the Common Agricultural Policy is unable to subsidise. I was then given a presentation about the group’s future plans. I heard how in 2012 the group felt it was running out of steam. So around the time of the potato harvest, they held an event called the ‘Frites Party’, where people went out to the field to help harvest potatoes, and then washed them, chopped them and turned them into chips, eaten in the field. Eric Luyckx said it was one of their most popular events that people still talk about to this day. Helped to bring new people into the group, and now it seems to be buzzing. I heard about their plans to build a brewery, grain mill and bakery on a site next to the garden. I met the local brewer who had created a new craft brewery in the village (very tasty it was too). 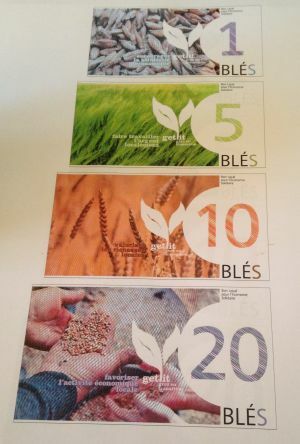 I heard about their plans for a local currency called Les Blés (see right), due to launch soon. I was also introduced to their fascinating Charter which governs how they work as a group and to help the local economy to transition, which I hope to get translated soon to post here. We then shared a delicious pot luck lunch, and did an interview for an upcoming programme about Transition, before heading off to Namur. 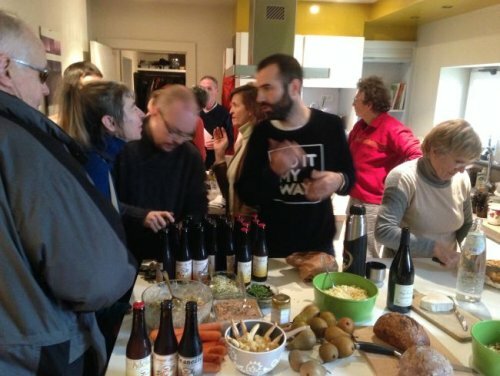 Pot luck lunch in Grez (photo RH). Rob Hopkins est l’initiateur du mouvement de la Transition qui, parti de Grande-Bretagne, compte plus de 1 300 groupes et initiatives de transition dans 43 pays. Il est devenu une référence dans le monde avec ses ouvrages dont le fameux « Manuel de la Transition ». Grez en Transition fête ses 5 ans ! [fr] . Octobre 2014. publie dans : Les événements. Projection de "Au nom de la terre", le film de Pierre (...) [fr] . Décembre 2013. publie dans : Les événements. Projection du film "Cultures en transition" [fr] Eric Luyckx. Novembre 2011. publie dans : Les événements. Evénement 5, conférence : Surgissement d’un nouveau monde (...) [fr] . Mai 2011. publie dans : Les événements. Festival de permaculture, quelques photos [fr] Eric Luyckx. 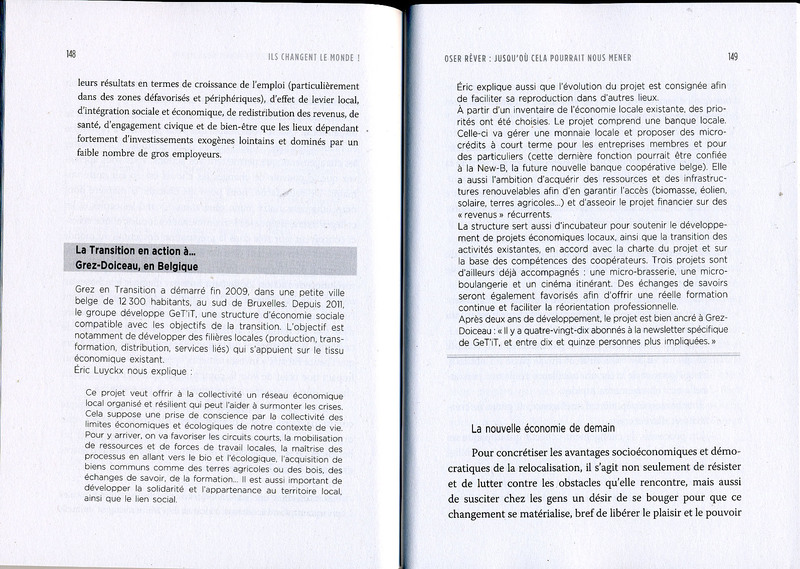 Septembre 2010. publie dans : Les événements. 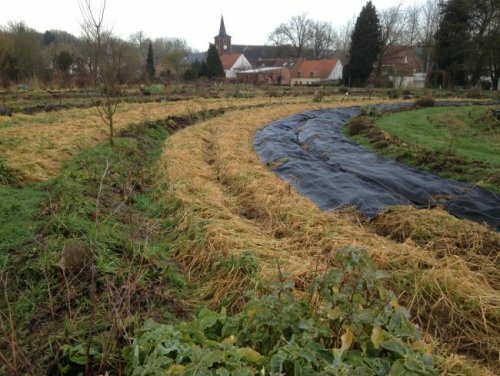 Festival de permaculture, appel à idées et participation (...) [fr] . Mai 2010. publie dans : Les événements. Evénement 2 : Grez en 2020 ? [fr] Eric Luyckx. Mai 2010. publie dans : Les événements. Evénement 1, atelier SEL [fr] Gaëlle Van den Plas. Mars 2010. publie dans : Les événements. Evénement 1, atelier "forêt comestible" : cueillette et (...) [fr] Michèle Vander Syp. Marianne Lambrechts. Danielle Blancke. Mars 2010. publie dans : Les événements. Evénement 1 : La crise ? [fr] Eric Luyckx. Mars 2010. publie dans : Les événements.